It shines a spotlight on the High Peaks Wilderness as a world-class landscape and it begs the questions of how and when will state agencies start to put together a world-class management system that the High Peaks Wilderness deserves. The three-million-acre Forest Preserve in New York State is finest state lands system in the U.S., but it does not enjoy the finest management in the country. Now is the time to press for improvements in the management of the High Peaks and demand that the administration of Governor Andrew Cuomo make adequate investments to build a network of sustainable trails, build proper facilities for parking and shuttles, invest in public education, adequately staff the High Peaks with planners, scientists, Rangers, and permanent trail crews, and effectively monitor and evaluate public use impacts. The Cuomo Administration’s refusal to invest in the management of the High Peaks is mystifying. The High Peaks Wilderness, and neighboring Hurricane Mountain and Giant Mountain Wilderness areas, are seeing the highest use in their history with mountains like Cascade Mountain seeing upwards of 40,000 hikers annually and others like Algonquin, Giant and Mount Marcy seeing over 30,000. More than 30,000 hikers walked through the gates of the Adirondack Mountain Reserve last year to hike the Great Range or Blake, Colvin, Dial or Nippletop mountains. In general terms, overnight camping has seen a slight uptick, but the number of day users in the High Peaks has risen significantly. State agencies spent over $9 million, with more to come, and added five new permanent state agency staff positions – the only new DEC positions this year – to build the new Frontier Town Campground. They’re poised to spend millions more to build the new multi-use recreation trail from Lake Placid to Saranac Lake. They’ve spent millions of dollars building miles of little used, road-like, class II snowmobile trails. Yet, the High Peaks Wilderness, which sees more people on one summer weekend than Frontier Town will see in a full season, or the new class II trail in the Moose River Plains will see in a decade (or two), receives scant investment and is plagued by poor trails that damage natural resources and undermine the overall hiking experience. The issue of overuse in the High Peaks has been well documented with crowds of hikers lining roadsides on Route 73 at trailheads for Giant, Dix and Cascade Mountains as well as on the Adirondack Loj Road. 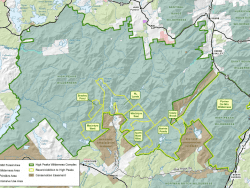 The past year has seen a flurry of proposals and reactions about ways to improve the management of the High Peaks Wilderness Area. Calls for reforms have ranged from trailhead parking permits, to trail permits for certain peaks, to more Rangers, to more state professional wildland managers dedicated to the High Peaks, and for rebuilding state trail crews. All of these ideas have merit and they lead to the same place – that the Cuomo Administration needs to make a greater investment in the management of the High Peaks Wilderness and needs to build a comprehensive management system and program. 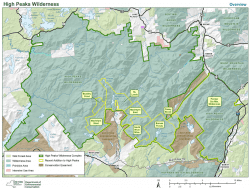 For their parts, state agencies finalized a Unit Management Plan amendment for the High Peaks Wilderness last year that approved facilities for newly purchased lands at the Boreas Ponds and made minor changes to current management. Chief among these was the re-route of the trail up Cascade Mountain and new trail to Mount Van Hoevenberg. The state also moved to ban roadside parking on sections of Route 73 near the Roaring Brook parking area for the trail to Giant Mountain, limited roadside parking at the Cascade Mountain trailhead, and established new public parking at the Mount Van Hoevenberg Ski Area for Cascade. Much of the trail work on both Cascade and Mount Van Hoevenberg must still be completed. As we move into the final month of winter and dream of a new hiking season, it’s clear based on the new state budget that the Cuomo Administration and state agencies are content with the status quo and to make minor changes. In 2019, the High Peaks will not receive a Frontier Town type of investment that that these wildlands so desperately need. This article is the first of two that examines the major questions facing the management of the High Peaks Wilderness. This one deals with the failure of the state to build a sustainable trails system. The second deals with the need for facilities that provide long-term solutions for parking, trail access, permits, scientific analysis for trails management, the need to build a robust public education system, and dedicated management personnel. Last fall, I hiked the new trail up Hurricane Mountain from Route 9N. It’s largely a modern sustainable trail that replaced the old trail that basically ran straight up the mountainside. The new trail switchbacks up the east side of Hurricane Mountain, gains elevation slowly, and follows a low grade. It’s narrow and employs many waterbars and drainage devices so that water is easily shed from the trail surface, which prevents erosion, standing water, and trail damage. The trail is routed to provide the hiker with a series of views from cliffs and brings hikers to natural systems such as beaver ponds, wetlands, and streams. The new trail is longer, going from 2.1 miles in length to 3.4 miles, with only about a half mile of the original trail used. The Hurricane Mountain trail was a pleasure to hike and is one of a handful of new sustainable trails that the DEC has built in the last 10 years. These include new trails on Coney and Goodman Mountains, Lyon Mountain, and Moxham Mountain. These are all well designed and well-built trails, engineered to withstand heavy use and protect the natural resources along the trail corridors. These trails also protect the public hiking experience because they do not easily erode and efficiently shed water, which prevents long slogs through muddy trenches. 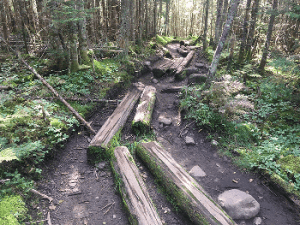 A simple question is “Why can’t all trails in the High Peaks Wilderness be as good as the Hurricane Mountain trail?” The answer is leadership and resources. Both are in short supply in the Cuomo Administration. The new trail up Hurricane Mountain took three years to build and involved the ADK Pro Crew, inmate labor, ADK volunteers, and two crews from the Student Conservation Association. DEC’s rule of thumb is that a major trail reconstruction and reroute takes a four-person work crew roughly 6.5 weeks for each mile of trail. In the High Peaks Wilderness, including the Giant Mountain area, there are roughly 500 miles of trails, many of which were built in the decades after the Civil War and run straight up mountainsides. More than 100 miles of these trails, especially at higher elevations, require closing and rerouting to build new sustainable trails. The High Peaks Wilderness deserves to have dozens of Hurricane Mountain style trails switch backing up and down mountainsides. Two years ago, the DEC organized a new High Peaks Trail crew, the first in more than a decade. They worked on campsites at Marcy Dam and Lake Colden. Last year, the trail crew was only a two-person crew and its work was limited. This year, DEC is planning for two five-person trail crews and is currently interviewing to fill out their ranks (click here if you’re interested). If these crews work from May through October they may be able to tackle upwards of 10-12 miles of trail work. The DEC priority has been to staff seasonal employees at State Campgrounds and not for trail work. The two High Peaks trail crews are not permanent state employee seasonal positions. 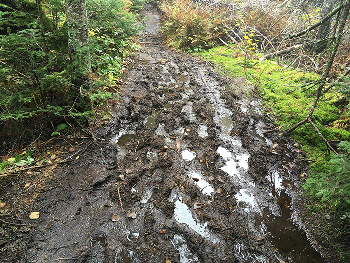 Many trails in the High Peaks have seen extensive trenching which are often filled with mud and standing water. Many places have seen work to harden the trails with rocks and stone staircases. These are difficult to build and oftentimes when the trails are wet or icy hikers walk around the slippery stones, which widens the trail. Many of these facilities have deteriorated from a lack of maintenance. In other places where trails have been eroded down the bedrock wooden staircases have been bolted to the rock face for hundreds of yards. These are Band-Aid solutions where trail redesigns and re-routes are needed. The two DEC High Peaks trail crews this year will focus on the new trail up Mount Van Hoevenberg and the re-routed trail on Cascade. It’s likely that these two projects will consume their season. The DEC needs to resolve labor issues that have removed the ADK Pro Crew from High Peaks work, develop other trail building partnerships, and work with local governments. With 500 miles of trails, many of which needs reroutes and reconstruction, there’s plenty of work for everybody. The missing ingredient to make this stew is leadership from the Cuomo Administration to make rebuilding the hiking trail system in the High Peaks a priority. By the metric of public use, the High Peaks Wilderness is a major success. The current dismal state of many of the trails does not seem to be a major deterrent. For many people hiking a mountain like a High Peak is no sure thing and is, and should be, a challenge. There are plenty of highly used and popular smaller mountains that provide stunning views, but the allure of hiking a High Peak is immense. For many the view from a High Peak summit and one’s sense of personal accomplishment, however measured, erases their slog over long sections of crappy trails. We need to change this equation so that people can continue to enjoy the High Peaks, push themselves to hike big mountains, create lifelong memories with friends and family, and do all this while hiking over beautiful and sustainable trails. Peter, you are absolutely correct. A friend and I hiked the Avalanche/Colden route up Marcy 50 years ago this June. The trails were heavily worn then, and both of us decided we had done enough to them. I can’t imagine the condition today. But I’m sure those new snow machine highways are wonderful. They need to start charging hikers, a hiking license, funds will help restore the trails and hire more rangers. I agree the hikers and bikers should be required to have a registration and carry insurance. What I would like to see is the people that want to hike should get together and fix/build, post signage and make safe all the trails that they have trampled down. Get out there and do it yourself or at least open your wallet and pay for it. Must be another outdoor user than a hiker, eh? 1) I love climbing up the bedrock on the trails you claim are worn out. It may take a footwear with the different rubber sole. Just look at the slabs up the flanks of Blake Peak; or the descent on Ore Bed Brook uphill of the current ladders to cite a couple examples. People see slabs and immediately head into the trees. 2) Most rock steps while are a good idea conceptually are a waste of time and resources for the reason you stated. Many are isolated and easy for people walk around. And contrary to your contention it doesn’t take ice to cause people to do it. It’s a preference for walking on the duff that does it. The most successful rock steps I’ve seen are through terrain that forces people to use them. Use the model that the State implements for another recreational activity – hunting/fishing. The money from those licenses + permits supports important fish, wildlife and conservation programs. Cycle, hiker, canoe/kayak permits would generate money for trail and waterway maintenance, staffing and other programs such as eduction and environmental initiatives. That would all be great if you folks would start paying your fair share. I’ve been buying hunting and fishing licenses for 60+years. None of you contribute one penny for your use of the Adirondack Park. We need a license system for hikers. Me Too! I agree 100%!!! In general I agree. But because there is not a system set up by NYS for hikers to pay for trail maintenance, Don’t forget we pay taxes on specialized outdoor equipment and state taxes just like hunting/fishing people do. Many of us purchase Habitat stamps and other State stamps that are offered. We also often are contributing members to various hiking clubs that perform a lot of the volunteer trail work mentioned above. And yes, many of us have actually performed some of that volunteer work. So I don’t believe it is fair to paint all hikers with such a negatively broad brush. There are many hikers that would gladly pay a license fee or day use or camping fee. But there are no DONATION cans at the trailheads. Perhaps there should be. We can’t very well contribute if NYS doesn’t give us a way to do so. Buy many.They make great gifts. I have patches going back to the start of the program – at least one per year. I only wish they were dated like federal duck stamps or were different every year. But I must say I have never bought them as gifts. Everyone should buy their own. Ah, yes, the NYS government needs to allocate more money to this use. It joins the list of projects needing more money endlessly long. And everyday a few more people depart NYS for friendlier climes, many because of NYS taxes. Lets do the same as everyone else and howl for more tax generated funds for our pet project. I suggest that tack is getting old. How about an entrance fee for those who chose to use the High Peaks? Getting others to pay for the endless demands for funds is a dead end street as the NY population declines. How many states in the country have a mandatory fee for hiking? If New York charges to use the forest preserve will it affect the number of tourists whose main purpose to visit is hiking? The Northwest Forest Pass used in Oregon and Washington is required at many trailheads is an example. The outdoor industrial complex is booming. The old funding tools and management strategies don’t cut it any more. The White Mountain National Forest in New Hampshire also requires that hikers purchase a parking permit. I have often said that charging for parking at certain trailheads is preferable to establishing a hiker “license”. 1) Parked vehicles very easy for even road-bound enforcers the check and ticket if necessary. 2) People are accustomed to paying for parking. 3) It would be difficult to define the threshold between simply “walking” on state land and actually “hiking”. (If someone is next to a stream with fishing equipment, they are clearly “fishing”; likewise for carrying a rifle during hunting season. An easier source of at least some revenue would be a camping “license” since a camper has clearly carried the equipment required spend the night and is a “stationary” target for any necessary enforcement. i have also suggested that a large off-road parking lot at the Cascade trailhead (no parking on the highway) could be a pay-to-park area as well as continuing to be a perfect spot to meet and educate first-time hikers. Tony I’ve been working on my 4000 footers in New Hampshire and I purchased the parking pass and have yet to need it for any of the parking lots I have used, so it’s not a requirement of all parking lots. Peter is correct that state resources have not been allocated to the places where they are most needed. High Peaks trails could certainly use much work, while i can never see Frontier Town being much of a public benefit. To respond to John’s opening comment, yes, 50 years ago the trails to mt. Marcy were in terrible shape. Those trails have benefitted from considerable good work since then, and I think you would clearly notice a positive difference – just don’t hike them a week after the snow has melted. The Hurricane trail that Peter mentions favorably tops out at 3,600 feet where there are still fairly deep soils that permit the switchbacking that makes that trail such delight to hike. Once one is above 4,000 feet, however, the soils become much thinner with nothing but smooth slabs of rock underneath. Any attempt to switchback on such terrain will likely end with the trail literally sliding off the original route unless it is elaborately pinned to the bedrock. Here the ladders such as are found on the Orebed trail and the south side of Mt. Colden are probably the only way to keep those trails from widening. I have suggested, and my organization, ATIS, has started in a small way to set pinned steps on steep rock. These require much, much less material than the great staircases on those other trails. An example of these is found at this link on Mt. Moosilauke in New Hampshire. http://www.offonadventure.com/2018/10/mount-moosilauke-via-beaver-brook-trail.html. In addition to building good trails, there must be regular maintenance as even the best-constructed drainage ditches will eventually become clogged and cease to function. I have seen many examples of a trail that at one time had good drainage, but now had water running down it. Cleaning drainage is good job for volunteers, but someone has to organize them. Between the 46-Rs, Lean2 rescue, ADK, ATIS and other private organizations, a great deal of maintenance is already being done by volunteers and privately-funded organizations. But a Peter points out, there are about 500 miles of trail in the High Peaks, and only a greater commitment by NYS can properly improve and maintain this network. Hiking license? No. So I want to go fishing/hiking/trapping, I have a license for that but I can’t go because I have to hike to my desired location and don’t have a hiking license? How about bicycle/mountain bike licenses? Canoe and row boat licenses, SUP licenses, kayak licenses, windsurfer licenses, kite flying license, skate board license. License everything, that’s the best answer. Odd thing this license business – odd also that DWI is a crime but you need a driver’s license to purchase alcohol. Should we have an alcohol license instead? How about a food license? If you get a DWI, the state suspends your alcohol license and your food license. Next up, a CO2 license, Methane license, Ozone license. This is all very messy. Let’s just go with a life license. All adults must buy a license to live. You know, so you can live in whatever state you want to, so you can get a job, buy a home and stuff, send your kids to school – oh wait – we already have that life license, it’s called taxes. Thanks for the comparisons to Frontier Town and other high-budget, low-use projects that could better be spent for getting good trails in the third-largest designated wilderness east of the Mississippi River. Maybe some enterprising person will start a park and ride business to the KV trailheads leaving cars parked at the new Frontier Town development or the Paradox brewery and avoid the parking on the highway and you can finish your day with a nice cold one! The division of DEC that is responsible for this is the Division of Operations. The root cause of the issues is that Operations has been the one division of DEC that has been slashed drastically over the years. During the 2008 recession, they lost 60% of their positions. That was in addition to cuts made in the 90’s. The end result is that there simply are no personnel to do maintenance any longer, with it either being totally dropped or passed off to volunteer groups. As for your complaint about prioritizing staffing the campgrounds, as someone who has worked in them, let me say that the staffing does not come out of the DEC budget. It’s paid for out of the campground revenues. Because of that limitation, campground positions have declined, and as a result, they’re badly understaffed. The campgrounds in my area have less than half the staff they did 15 years ago. Add in that the campgrounds also need major maintenance, and it’s added to the problem. Someone has to pay. How would you propose hikers pay their fair share in the Park? I would bet there are more hikers than all the other outdoor activities combined. Hunting/trapping/fishing/boating/snowmobiling all require licenses and knowledge of regulations. But in general, they are all low impact. So if the highest number of users create the lion’s share of impact on the trails, they need to pay up somehow. Forcing NYS taxpayers to pay for it all seems absurd if only a small fraction ever hike. I am also for some sort of hiker licensing or per use fee in the Park both for basic education and for revenue. Perhaps even a “Return a Gift to Trails” on NYS tax forms. There is no such thing as a boating license in New York State. You are correct. In my mind I was combining licenses and registrations as sources of revenue, but that didn’t make it to my fingers. I believe that a fee to use the park for hiking would require an amendment to the NYS constitution and that is not easily accomplished. Also, state tax dollars have already been used to purchase these lands and charging a fee would be a double taxation of sorts. I am not against a fee, but as many others have stated in discussing this topic, worried that the money will disappear in to the state’s general fund and not be used for the intended target. I do believe that a hunter or a fisherman can count on at least some of their license fees being used to support stocking or habitat. Only NYS taxpayers have paid for the land acquisitions- not all visitors to the Park. Fees are currently charged at many State Parks – both day use and camping. I don’t think charging fees would be an insurmountable task – including parking fees. But I do believe NYS residents should pay less of a fee than non-residents for the reason you state. And yes, I believe licensing should be part of the solution. One of the biggest problems is that the Adirondack Park, in general, is huge. It is the second largest state park in the country, and the largest in the lower 48. How the hell can a single state, no matter how much we tax the citizens of that state, pay for it. Trail maintenance, trail repair, lean-to maintenance, SAR, and so on. These are all the responsibility of the state and DEC. State Parks are not even run by rangers, only attendants. Without volunteers, the entire labour system will fall apart. But out of state people form a significant portion of the people that use the park. Hell, even our Canadian friends form a sizable chunk of users. Well, I spend a couple months up there each year. Mostly backpacking, but, NEVER in the High Peaks (at least for the past 20 years.) I love wilderness areas, I practice LNT mostly. I don’t usually camp within 4-5 miles of a road, but, this is difficult, generally. The High Peaks is probably the most “un-wilderness” wilderness area in NY. They are planning to use stones and timber to “pave” the trails, Who pays for this? Is this a characteristic of the “wilderness” of the future? Paved walkways up a hill to see the view with a few out houses along the way? (Nope, it AIN’T really wilderness.) WHO PAYS FOR IT? WHERE DOES THE LABOR COME FROM? WHAT DOES THE DEFINITION OF NATURAL MATERIALS MEAN? WHY ISN”T THE STATE CHARGING A FEE FOR THIS? Any of the work it does in the ADKs is paid for from my (our) taxes. But others never pay anything to use the ADK’s. They just take their pleasure, drop money for food (they would have anyway) drop a few dollars in the camp grounds (cheap compared with renting a motel room) and spending money on fuel to drive around. There needs to be a licensing fee for back-country hiking/camping. A simple license for camping should be attached to the outdoorsman license at a slight increase to existing licensing, maybe $5 for NYS residents. It would HAVE to be purchased by all non-residents for $30-$50 per person for all non-residents for a period of two weeks, renewable for another two weeks for $10. I paid close to $50 for 5 days to go to PA for some fishing. If they can do that, so can we. Maine charges and reserves campsites at Baxter. Non-residents pay extra at many other states… We should do the same. Not to but a kabash on tourism, but 75million visitors in the ADK’s is enough. NY has to slow down/halt the number of people that are causing the ADK High Peaks to go to hell. I will say again, I refuse to go there because of the number of people, NOT because it is hard to hike. I choose locations to go to that are not “easy” to get to. I don’t mind the company if I happen to run into someone of like mind. I would far rather the rest be highly protected by the best we can do than to let the rest of the ADKs turn into another Eastern High Peaks fiasco as it exists today. Some of the comments here are really despicable. People so willing to just throw away their basic freedoms on a whim. Probably lots of professional trolls here too pushing the agenda for the corporate state. I don’t ever once recall dreaming about my time in the woods becoming like a day at the DMV and just the thought makes me want to puke. Gonna start requiring supposedly free people to start getting government permission to do damn near anything, then of course that won’t be enough so what’s next. Won’t be long before the political criminals are looking to privatize everything & sell off those contracts to their “contributors”. Maybe start renaming the peaks after major corporations that are willing to pay for it, just like all the sports stadiums and arts centers. Then we can increase the policing of all these new regulations to prey on all the “offenders” for revenue intake, just like the cops do on the roads. Broken tail light, bet we can upsell that into a drug charge. Start accosting people in their tents to make sure they have their papers in order, yah, that sounds great. Maybe roving swat teams in the woods to bring “stop & frisk” to the north country. Wow. Forget your meds today Kyle? “I don’t ever once recall dreaming about my time in the woods becoming like a day at the DMV and just the thought makes me want to puke.” I agree 100%. I hate the idea of standing in line to head up a hill. “Gonna start requiring supposedly free people to start getting government permission to do damn near anything…” Hmmm, I thought that was freedom. Ya’know, I don’t hear hunters complaining about hunting rules, restrictions, and other legalities. I don’t hear ice skaters complain about paying an arena for ice to skate on off-season. I don’t hear fishermen complaining about fish hatcheries. Why is that? Because these “rules” were enacted to prevent OVER hunting and stocking. Ice machines require machines, area and maintenance…or dollars if you prefer. The number of people in the ‘peaks means something has to give. Either the “Wilderness” is broken…permanently, or, the number of people needs to be reduced. Licensing hikers cannot, will not ever control the demand for access to the High Peaks. Initially there may be a lull, but given enough time all those desiring to enter the High Peaks will have a license and thus the overcrowding alleged in the High Peaks will resume. Licensing does not control demand whatsoever. If the true goal of protection of the High Peaks allegedly requires less hikers, then simple restricted access is more than likely the only viable method of controlling demand for access. DEC is taking steps in this direction already: Restricting parking. This is the simplest form of restriction and the cheapest to implement. The next step is the permit system, a fixed number of permits per day. I don’t like this idea much at all, but there are not really any other further alternatives sans a border wall around the High Peaks region or simply declare that all trails will be removed, unmarked, no cell signals and no rescue is available to those that venture in, kind of making it more of a risk scenario than just a walk in the park. Another less likely method is to provide another competing destination to draw folks away from the High Peaks region. This just may be the tenant of the re-envisioned Frontier Town. How this plays out is anyone’s guess. Sort of a build it they will come narrative. Agree on all points! However licensing is not designed to reduce demand in any setting. Licenses in general are set up to protect the public by ensuring basic knowledge/safety of the activity and/or to protect resources like in hunting/fishing. As you say, licensing alone is certainly not the answer to the situation in the HPW. But neither is reduced parking alone or permitting alone. The situation will require numerous changes in management – and, most importantly, it will require a different attitude on the part of hikers. Hiking in the HPW isn’t like taking a walk on the village green. It requires preparation and some basic backcountry skills that not everyone grows up learning like many of us have. But just like gasoline taxes for road repairs, somehow hikers (users) should be a significant contributor to the costs of maintenance. That will likely come in many forms which have been touched upon in this discussion. In other places maybe close or remove the road that lets people drive so close up to the summits with just a short walk to a place that’s getting way too much traffic. If too many people are willing to park and do the 5 mile hike up & back, close all roads/parking areas till it’s a 10 or 12 mile hike in to that area or even have some areas where the nearest road/vehicular access in requires a multi-day hike/back-country camp just to get there. Lots of people will just go to easier, more accessible day hikes & hopefully take their coolers, kegs, radios & garbage with them. I agree, many of the trail remediation attempts have been heavy-handed. But they are emergency steps that have been taken to remediate bad trails that were never “designed” by anyone. I don’t believe anyone thought they were the ideal solution. Many, if not most of the trails in the HPW were “constructed” by widening and maintaining 100 year old, rarely used herd paths. The negative results of that plan started to become evident 50+ years ago, and has only continued to get worse. As you say, the entire HPW needs to be rethought – changes in access, changes in routes, closing routes, and building more stable routes. Certainly no quick or cheap fix. But I believe DEC is now tasked with determining “holding capacity” of these lands and to plan and manage appropriately to minimize environmental damage while maximizing the backcountry experience. How they will do this across numerous administrations remains to be seen, but it will certainly require many compromises and discussions such as this. Yes, quite…Licensing and restrictions in some areas are necessary. Licensing will pay for the clean-up, repairs, maintenece and the extra manpower needed to make it happen. Restrictions will keep the outdoor people from congregating in one place, as much as I do not like this idea, emotionally. I would hate to be turned away at the gate.but, “All who wander are not lost” has meaning. There are still a lot of places to wander too. Why are HPW trails not closed during mud season? Better yet why don’t hikers not use them during mud season? It seems they really don’t care about the resource? We don’t drive on many woods roads during mud season because it ruins them and costs lots of money to fix. It IS a simple concept, and for that reason many hikers do not hike in mud season. Other hikers are simply unaware of the issue. The rest simply do not care. Trailhead signage usually won’t change someone’s plans at the last minute. I don’t even think closing the trails would either – especially with no one patrolling to enforce closings. Boils down to education and ethics. But perhaps restricting parking appropriately would be a start. On a separate note, TRUE mud season is pretty long in the Park, let alone the HPW – say mid-March through July, depending on elevation and terrain. Local business likely cannot survive on trout fishing alone. Limit access by permit like they do in Maine’s Mount Katahdin. Simple ,low cost with minimal increased tax burden. Also I’m in favor of a paid permit system to hike the over used high peaks. I have not been to Katahdin yet, but it’s my understanding there is only one way in and it is easy to control access to that park as a result. Just too many entry points in the Adirondacks. Tell that to the State James who have been pretty big on advertising downstate these past few years towards getting people to come up to the Adirondacks. Tourist dollars! Money to feed the town coffers! Money first! Economy first! Same old story! For anyone advocating licensing, I’d love to hear about even one example where adding bureaucracy into anything turn out an improvement. Not only is licensing definitively, not necessary, it would be unlawful and unconstitutional to try to restrict or infringe on people’s right to travel where they will, as they will in the public domain. Now, it’s well known, that in the fascist state of New York, the constitutions are violated so widely and so often that they are starting to resemble a greyhound terminal crack whore, but that doesn’t make it ok to keep piling it on as the politicians would like. It makes it that much more important to put a stop to it at every single turn where it comes up, before our kids & Grandkids have no freedoms left at all. I have a nightmare that one day, one of my Grandkids will look at me confused & disturbed to hear that in my time we had much more real freedom and demand to know how I could have squandered it & surrendered him to despotism without even a fight on his behalf. To let it go as if it had no value at all. 250 years ago, real patriots, gave everything to establish our freedoms and I’m pretty sure they expected future generations to hold them at all costs, not to just whimper sheepishly and bow our heads in subjugation to commandant Cuomo & his ilk every time they came up with a good reason why “it was for our own good”. What is necessary, is for, as the article alluded to, for Cuomo who has marketed far & wide for people to flock to the Adirondacks, to pony up to his responsibilities, stop having parties with taxpayer money and fund the necessary maintenance of the resource. I’m certain there is ten times more cash on hand already than is necessary, we just need to introduce some politicians to the concept that it’s not ok to keep stealing it for themselves & their cronies, all living it up at our expense. Slow but sure they’re taking away more and more Kyle! Little increments at a time while everyone sleeps. Kyle, please give it up. You are selecting very poor examples for support. “For anyone advocating licensing, I’d love to hear about even one example where adding bureaucracy into anything turn out an improvement.” Sure. Hunting/trapping licensing. By limiting the take on beaver, the trapping license protects the clean water of the ADK’s through limits. Look up what happens without the licensing/limits. I do not look backwards in time except to learn the lessons there. You seem to think I support Coumo. BAD assumption. His finger is all over the APA causing more trouble than he even knows. The ADK’s was founded to protect what was LEFT after the destruction wrought by our fore bearers. To little and too late, they decided that the woods, the animals and the water all needed protection from the PEOPLE who were running rampant through it with large amounts of dollars. After it was mostly ruined they decided the state could have it again. Cuomo is only doing what I expect politicians to do, follow their constituents…ie the majority vote. I’m sorry but that is a foolish analogy. Hunting/trapping is both an activity removing something that is a public resource, the taking of game animals and 2) a use of firearms in the public domain which is not entirely imprudent to require some level of competence & code of conduct. Though, as a hunter, I have seen it throughout my life, where “licensed hunters” still behave like idiots, because you can’t legislate away stupidity. Still, it is not even close to the action of taking a walk in the forest. The destruction of the resources you speak of from the past was, both in a different time and more than anything else, primarily unregulated [[commercial activity]]. The PEOPLE, inherently ot commercial, through their government, have every right to regulate commercial activity on public lands. Nobody taking beaver for their own, personal use (not to sell), could ever destroy the resource that way. Logging, mining, using seaplanes to bus people in to fishing camps etc, all things that should be licensed and regulated, even taxed to pay for conservation. But people in their own private use, of their public lands are not the same, at all. Even the hunting license for private hunting is a corrupt practice. Just watch an episode of North Woods Law to see our public servants violating their oath of office on national television, for entertainment purposes. I would simply submit that tourism IS a commercial venture. The crowds in the EHP are a real problem. It is NOT limited nor regulated. For an example, many of the “guided” groups, send runners far ahead to claim shelters in the best spots intentionally avoiding the first come, first serve rules, the same as lobbies pervert our government. Trails are pummeled to mud holes requiring artificial intervention, ruining the wilderness character, requiring stone pavement and staircases. Wilderness? I will simply state that there are too many people for the area to survive being a wilderness. I will NOT go there. I am not a believer in regulation, big business, big government, and controls on my movements or what I buy or where I eat, let alone what I think. I have seen what has happened to the EHP in the past 60 years. Not a simple choice, but regulation, licensing, and permits are the only reasonable course to prevent the destruction of the EHP Wilderness. In theory, I do NOT support this action. But, unregulated tourism HAS created a real problem there and it is spilling over to other places. Tourism is destroying the whole of the ADK’s and increasing in it’s effect. Education is key, but without licensing, it is difficult to insure that EVERY HIKER IS TRAINED, and even that is only by the written word. Only limiting the number of people in the wilderness can save it for my grandkids and theirs. This is the lesson from the past 200 years. Yelowstone has permits, for example. Why was this instituted, do you think? So future generations can still enjoy it. In 1880, NYS held the wilderness in such high regard that they hired “Conservation Officers” (evolving into the DEC) 20 years BEFORE they created the NY State Police. The main job was to protect the lands from commercial over harvesting, as you say. Tourism has a similar effect on the environment. The people are harvesting their views at the expense of the land. When did people loose the vision of wilderness? Everyplace has a carrying capacity. With maintenance, education, and licensing, we can increase this without damaging it too much. BUT WHERE DOES IT STOP BEING WILDERNESS? When do people say, enough with crowds and enjoy the solitude of the wilderness? When does enough become too much? Sorry, I disagree strongly. The limits imposed by parking or by other access restrictions will not work. People will “buss” into the EHP. Now we have to deal with larger groups. We tried limiting the camp fires. People still came. We tried making packs heavier with Bear “Balls”. People still came. We tried to limit camping areas. People still came. We added outhouses. We added steps, bridges, groomed trails, ladders, and lean-tos. All destroying the wilderness. Not much else we can do. Now we are up against it. Turn it into the ADKs playground, or, limit the number of people. It is not what I consider a wilderness, anymore. Just a bunch of well groomed, well policed, paved walkways up and down a hill in some cases. Don’t let it happen to the rest of the ADK’s! I’m glad to see we appear to agree on many fronts. I also haven’t been in the EHP for several years, specifically because of the crowds. I seek out real wilderness & solitude, not peak bagging and summit selfies but the license issue an absolute non-starter. Every license is a contract by which you agree to be legally bound when you put your signature on it. That contract suspends your rights in specific areas, most of which you aren’t even aware, replaced by privileges granted to you by the government of which your are now placed in a subordinate position to. Most people enter into these binding contracts day in and day out without ever even understanding the terms to which they are agreeing to be held. This is why people constantly get abused by “authorities” and railroaded when they fight it in court because they think they still have their constitutional rights, when they previously signed them away in exchange for some government privilege. I do not ever place myself or my family in a position subordinate to professional politicians. Look up the word License in a law dictionary. (Permission from some competent authority to do or perform some act which without such permission would be illegal) When did it become illegal (note the word LAW is not in there) to take a walk in the forest? This is a very dangerous precedent to set, especially with the unfathomable level of corruption in gov. these days. You say it is a way to “insure that every hiker is trained”… So now there is training? and I’d assume a test that must be passed before you are allowed to walk in the forest? Trained to who’s standard, in what methods, approved by who? I smell bureaucracy. 1) I agree it’s important to be educated 2)training & education can be done voluntarily, without force of government & all the associated perils 3)What provision is made for people who’s experience already exceeds that of the “trainers” by an order of magnitude? 4)Training is worthless without the will & integrity to make use of it. Evidence the “Driver’s License” and your memory of how often you’ve had some Manhattan socialite driving her seven thousand pound Escalade 24 inches off your rear bumper at 75 MPH. Are not licenses supposed to prevent that kind of behavior? Even better, take a look at the entire, vast, multi-billion dollar industry that has grown up around the enforcement of those license [regulations]. People these days get a license for something and come away with some absurd sense of credentialed entitlement and even less responsibility then before. Cuomo has spent serious cash calling people to the area & he’s spent none trying put out the word of personal responsibility while you’re there. I agree that something should be done to limit the number of people into this sensitive area, just not doing it by a license. I submit again, make it so the closest vehicle access to any summit is approx. 15 miles out, round trip, and 3/4 of the day walkers will want no part of it. Where were you Kyle when the State proposed cars can park within spitting distance of those jewels the Boreas Ponds! Pretty sure I was loudly speaking out against it, even knowing it was falling on suit clad, deaf ears. This is what happens when people continue to just willingly fold in under the lordship of the nobles. Charge the hikers a fee to pay for upkeep in the High Peaks!